I thought about how I could make a more multidimensional vision statement for the interview. I began in Canva. 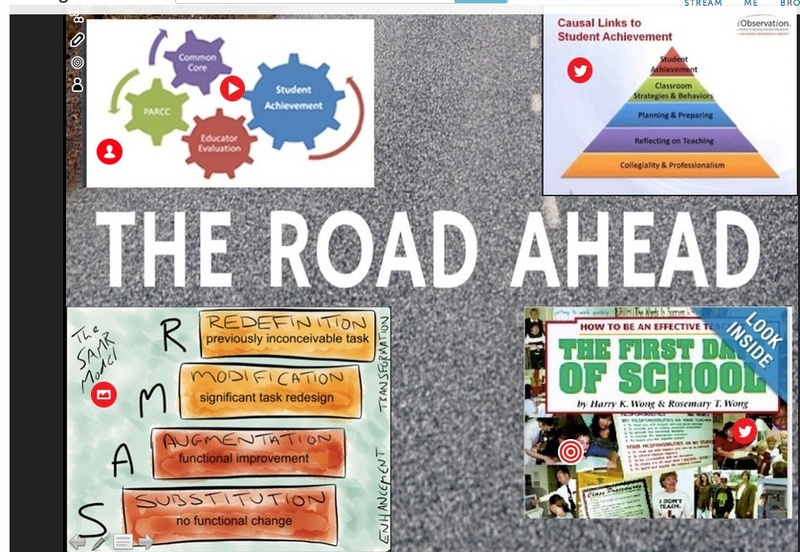 In Canva I found a title slide called the Road Ahead. I layered that with images related to important talking points in the interview which was for a Staff Development/Induction Specialist Position. I placed pictures of SAMR, beginning teachers, Marzano, and CCSS in the Canva. When I was done with that portion of the hybrid app-smash I thought about how I could make it more interactive. I took a screenshot of my Canva and placed it into Thinglink. Thinglink was introduced to me by my ADE buddy Lisa Johnson at the Ed Tech Teacher November 2013 iPad Summit. I made video snippets/talking points with my avatar in Tellagami that I placed into the Thinglink. I also used a VideoScribe that I had made outlining my vision about the SAMR model and the district. I also inserted a clip I had made in Go Animate about the trials and tribulations of a first year teacher. I have taught in a Flipped Classroom and assisted in running Flipped Faculty Meetings but this was the first time I had participated in a Flipped Job Interview. The Assistant Superintendent who was interviewing me looked at my Digital Vision Statement in Thinglink ahead of time and that led to a more enriched interview for both of us. Perhaps Thinglink and hybrid app-smashing can be useful to some of you in your journey as life-long learners.